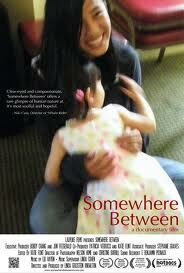 In SOMEWHERE BETWEEN, filmmaker Linda Goldstein-Knowlton follows Chinese-American teenage girls around with her camera for three years. You know, I tried to do that and only got an arrest and a restraining order. Rimshot! Wakka wakka wakka! Know that Goldstein-Knowlton’s 2011 feature is high-minded indeed. As the adoptive mother of a baby girl from China, the documentarian says up front she sees this film as a personal project from which her daughter will someday take enlightenment and inspiration. And from that moment…Linda bows entirely out of the narrative. Which at least one reviewer thought took a lot of impetus out of the film, but which I considered very commendable. The director’s popping in and out like Morgan Spurlock all the time would have seemed a little self-aggrandizing, in a scrutiny of the phenomenon of Chinese adoptions that has greater scope than one might think. And not just that for viewers of my age, the Peoples’ Republic, as late as the 1980s and early 90s, still had a Cold War vibe as a “forbidden” nation, insular and Mao-oriented. Now, of course, China is a high-tech economic powerhouse and tourist destination. But it is an emerging scandal that many Chinese “orphans” who suddenly became available on the, er, market, were not orphaned in any literal sense, even though that was supposed to be the case on paper. Most females came from intact families, but they had been abandoned deliberately, in a cruel blend of old and new; the former a longstanding folk-tradition that daughters are devalued and unwanted in Chinese culture, the latter Beijing’s one-child-per-family policy to cut down on the superpower’s daunting population boom. Put them together, and you had countless infant girls shed by peasant households, as deadweight or failed tries at having a male heir. For the four Chinese-American girls followed in SOMEWHERE BETWEEN, adoption looks like a success story. They study hard and seem well assimilated into the American melting-pot, in affluent households from Berkeley to Nashville (and they all have Macbooks). Still, they get curious about their biological parents back in China, suspecting the worst – that they were deliberately rejected. One girl, Fang (AKA Jenni), doesn’t even know her true age, making birthday celebrations somewhat forced. Inevitably they gravitate China-wards themselves, learning Mandarin and making the trip across the Pacific. Fang comes across a Chinese foundling considered un-adoptable because of cerebral palsey and tries to personally arrange a stable US adoption, though she’s barely a young-adult herself. Yes, way to go to make a movie critic feel utterly inferior. At Jenni’s age I think I was mostly trying to read all the Alan Dean Foster novelizations of the Saturday-morning TV Star Trek cartoons in proper order. Seemed to have some importance at the time. Haley Butler, though transplanted to Tennessee, also goes back to China to seek her roots. Incredibly, via asking passersby for mere sight-reading of her ethnic features, Haley manages to get a face-to-face encounter with her father (it’s a literal miracle for the adoptee, a Christian who believes things happen for a divine purpose). She gets a fragmented tale from her father’s side of the family about how she was given up by her mother, who remains mysteriously and guiltily offscreen. Haley goes through an emotional wringer in anticipation of finally seeing this possibly cold-hearted mom, and the film takes us with her.